Owen Ashworth's Monday Mix spans generations. Owen Ashworth might be our most musically-seasoned Monday Mix contributor. You probably know him as the man behind Casiotone for the Painfully Alone, which was the name he played under for over a decade before retiring it in 2010. Owen now performs under the moniker Advance Base and runs his own label called Orindal Records. I had the chance to meet Owen while he was touring in the fall of 2012 and he played a beautiful, stripped-down session (and DJed!) on my radio show. Owen was kind enough to make this week's mix, which he loosely themed around the release of Orindal Records' artist Julie Byrne's debut album. We reviewed Julie Byrne's first EP, Faster or Greener Than Now, last January and spent the rest of that winter being warmed by her stunning and unique approach to folk music. To be honest, this is the first mix I've received where I've only known literally three of the artists on it. But based on Owen's musical history and taste, I can absolutely guarantee it will be one of our most fascinating mixes. "I made this mix to celebrate the release of Julie Byrne's debut album, Rooms With Walls and Windows (out January 21 on Orindal Records). I picked twenty tracks by friends & heroes alike who, in my mind, match the intimate mood & adventurous spirit of Julie's music. This is a mostly gentle collection, ranging from traditional folk songs to abstract indie tunes. This music was sung or performed by women both young & old. The Shaggs & the Kossoy Sisters were teenagers when they recorded their tunes, & Elizabeth Cotten was 74. The last piece of music is by American electronic music pioneer Ruth White, & it's terrifying." 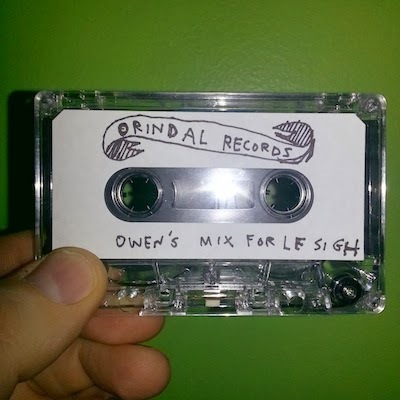 Monday Mix: Orindal Records from thelesigh on 8tracks Radio.